The Yankees took two out of three from the Mariners this weekend, on the strength of terrific starting pitching and a bit of timely hitting. They remain just 2.5 games up for home-field advantage in the Wild Card game, though, as the A’s swept through the Rangers. The A’s face the Orioles this week, so it’s tough to see them slowing down – and that means the Yankees need to take care of business against the Twins. The Yankees won the first game 14-1, with every starter reaching base at least once. Didi Gregorius (via grand slam) and Tyler Austin (now on the Twins) both had four RBI, and Giancarlo Stanton went 4-for-4. The team went 5-for-11 with RISP, to boot. Gregorius had a fairly absurd series, going 7-for-16 with 3 home runs and 9 RBI. By the time Minnesota left town he was hitting .354/.452/.793 on the season. Aaron Judge reached base at least twice in every game, and went 5-for-12 with two doubles, a home run, and six walks overall. Check out Katie’s Yankeemetrics post for more fun facts. Jason Castro, Adalberto Mejia, Logan Morrison, and Ervin Santana are all done for the season. Tyler Austin (back tightness) and Miguel Sano (left leg contusion) are both day-to-day. The Twins are 65-77 with a -70 run differential, which is good for second place in the awful AL Central. They have the starkest home-field advantage in baseball, sitting at 41-30 with a +8 run differential at home and 24-47 with a -78 run differential on the road. Unfortunately, they’re hosting the Yankees. After overachieving a bit last year, the Twins were back to sellers in 2018. 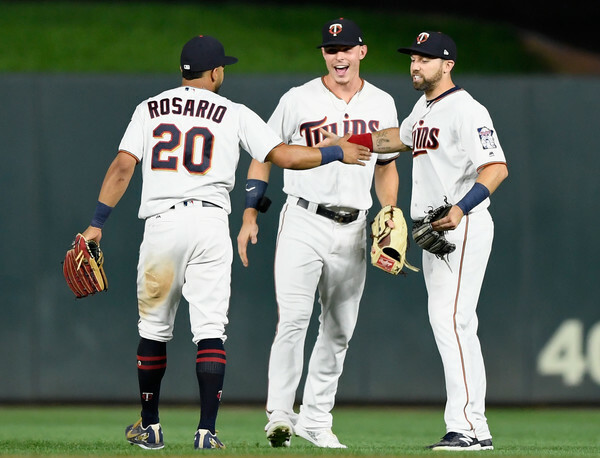 They dealt Eduardo Escobar, Ryan Pressly, Zach Duke, Lance Lynn, and Brian Dozier heading into the July 31 trade deadline, and sent Fernando Rodney and Bobby Wilson packing in August. The returns in these deals were generally quantity over quality, per most outlets, but the Twins still have some tantalizing young talent. One of those talented youngsters is Byron Buxton, who has been making headlines for being shut-down by the Twins in what is clearly service time manipulation. He wasn’t good when he played in the majors this year (his 4 OPS+ is a testament to that), but he was brilliant last year and is still just 24. The front office has used the “he’s not fully healthy” and “there’s no place for him to play” arguments; the former may hold water (Buxton denies it), but the latter is tough to swallow when folk like Robbie Grossman and Johnny Field are playing in the outfield. Manager Paul Molitor has used a slew of different lineups this year, which isn’t terribly surprising given the roster’s talent level, trades, and injuries. Predicting what they’ll trot out there on any given night is anyone’s guess – and I’m anyone, I suppose. Willians Astudillo (139 OPS+ in 38 PA) will see some time at catcher, and Tyler Austin (108 OPS+) and Miguel Sano (85 OPS+) should get into the starting lineup if they’re healthy. 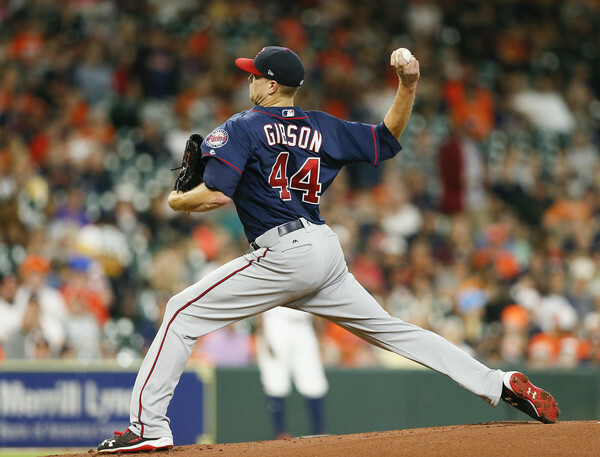 Gibson has had a mini-breakout this year at the age of 30, posting career-bests in ERA (3.74), ERA+ (118), strikeouts (158), and strikeout rate (22.0%). He has shown flashes of competence throughout his career, and may well have turned the corner via consolidation this year. Gibson is a legitimate five-pitch guy, with a low-to-mid 90s four-seamer, a low-90s sinker, a mid-80s change-up, a mid-80s slider, and a low-80s curve. He gets a lot of whiffs on the slider and curve when they’re right. The fourth overall pick in the 2013 draft, Stewart made his big-league debut on August 12. His climb through the minors was slow and steady, and he did not reach Triple-A until his fifth professional season. Some of that is due to the Twins approach to pitchers, but his unspectacular performance once he reached Double-A certainly didn’t help. Stewart’s a former top-50 prospect, though, and his pedigree still means something as he’s still a month shy of his 24th birthday. Stewart’s another five-pitch guy, with a low-90s four-seamer, a low-90s sinker, a high-80s change-up, a mid-80s slider, and a high-70s curveball. His stuff’s not too different from Gibson’s, but he hasn’t shown the ability to get whiffs just yet. The Yankees beat-up on Odorizzi back on April 23, scoring five runs in 4.2 innings, and putting eight runners on-base. The 28-year-old has had a somewhat rough year, pitching to a 4.57 ERA (96 ERA+) in 147.2 IP with the worst full-season WAR (1.2) of his career. Trevor Hildenberger inherited the closer mantle when Rodney was dealt, and he’s five-for-five in save opportunities with a 2.61 ERA since then. His overall numbers are solid, with a 4.21 ERA (105 ERA+) and 21.5% strikeouts in 66.1 IP. Taylor Rogers (3.02 ERA and 29.3 K%) is their best hand out there otherwise, with Trevor May (1.65 ERA and 36.4 K% in limited duty out of the bullpen) and the disappointing Addison Reed (4.70 ERA) chipping in from the 6th inning onward. Willians Astudillo is kind of the position player version of Bartolo Colon, and is generously listed at 5’9″ and 225 pounds. He swings at everything (0.0 BB% and 5.3 K% in the majors, 3.3% and 4.6% in Triple-A), and is fun to watch at the plate and in the field.